A Siberian husky, with their iconic colored fur and piercing eyes, are nothing short of majestic. Their intelligence puts them as the 45th smartest dogs and the American Kennel Club lists them as the 12th most popular dog out of 194 breeds! According to some people, that figure on intelligence is actually a sore underestimation, too. 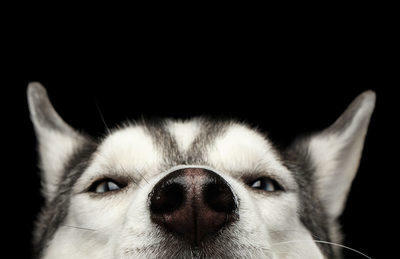 Huskies are working dogs, no doubt, but they’re also lovable and goofy. You would be hard pressed to find a “cutest dogs” list without them being featured. From distinctive expressions to sheer endurance, the husky has it all. Below is a brief guide to help you get to know this breed that everyone is falling for, and to help you decide if a husky would be well suited to join your family! First, while you can have a husky in a variety of climates, they love cold weather. If you live in an area that gets seemingly never-ending snow, this pup would love to make snow angels with you! Even if you live in a warmer area, you can still keep your husky cool with air conditioning and proper grooming. If you have family living with you, the husky will see this as picture perfect. They love to play with their humans, especially outdoors! Because huskies are so active, they make fantastic workout buddies and hiking partners. The only concern here is that you must ensure your husky is well trained, and huskies are known for being terribly stubborn. On DogTime.com huskies are rated only one star in the category Good for Novice Owners” for that very reason. Training them takes more time and effort than some other breeds. Nonetheless, the combination of intensive training and consistent exercise will ensure both of you get what you need and want from your human-canine partnership. Huskies are extremely social. The American Kennel Club features their history on the breed’s webpage and notes that they have functioned as both companions and working dogs since their emergence. For this reason, pet parents who work long hours and don’t have a family at home to spend time with the dog should not bring huskies into their homes. If this dog is frequently left alone, their mental health will suffer. Additionally, any husky pet parent should make adequate time for exercise and huskies should not be stifled in small homes. Rather, they should be taken on walks or runs and have considerable freedom of movement in a large backyard. According to PetMD, the breed can sometimes run “aimlessly for hours on end.” Running is quite literally what the breed was made to do, so the importance of their freedom to run cannot be understated. Finally, the husky is Houdini among dog breeds and are infamous for their ability to escape over or under fences (and more). If you do not have a very secure yard, your husky might escape and get lost, injured, or even killed. That would be heartbreaking and can be avoided with the proper precautions and realism about your ability to care for this specific breed. It’s not hard to see why everyone fawns over huskies, but remember that they aren’t for beginners! Their companionship and loyalty is pure gold, but their wills are stronger than steel. Also, know that if you determine that you can’t adopt or buy one, that doesn’t mean you can’t spend time with them! Volunteer at a breed specific rescue or become a dog walker for community members with huskies. There are many ways you can have huskies in your life and help them while they continue to enrich our lives. So find your place and hike up!